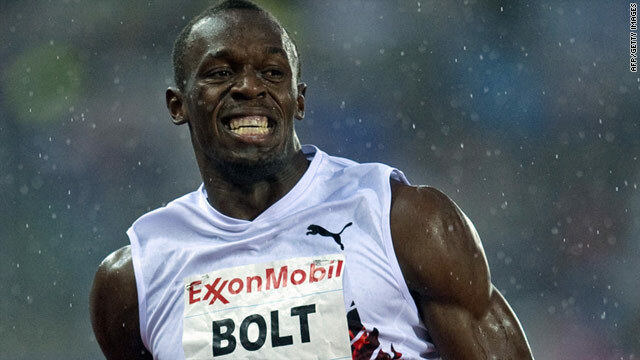 Usain Bolt brightened up a miserable evening with an impressive victory in the men's 200m in Oslo. (CNN) -- Double world and Olympic champion Usain Bolt brightened up a dank wet evening by cruising to a comfortable 200m victory at the Bislett Games in Oslo on Thursday. The 24-year-old Jamaican tore a sub-standard field to shreds, clocking an impressive 19.86 seconds -- the fastest time in the world this year -- despite driving rain. Gambian-born Norwegian Jaysuma Saidy Ndure finished second in 20.43 seconds with Bolt's compatriot Mario Forsythe taking third place a further 0.06 seconds adrift. It was Bolt's first 200 meters run for 13 months, since his appearance at the Shanghai Diamond League meeting in May 2010, and he told reporters that he was happy with his performance. "Apart from the weather, it was all good and the track was pretty good. I'm now on my way home for three weeks of training and will be back in Paris on July 8." Apart from the weather, it was all good and the track was pretty good. Meanwhile, there was a surprise result in the women's 800m, where world champion Caster Semenya was beaten by Moroccan Halima Hachlaf. Hachlaf produced a superb sprint finish to get the better of Russian Mariya Savinova, with Semenya back in third place, in a time of one minute, 58.27 seconds -- the fastest this year. Despite her defeat, the South African, who stormed to world prominence in Berlin in 2009 before her career went into limbo because of doubts over her gender, was satisfied with her run. Semenya told reporters: "This is the road to the world championships in Korea for me. "I need to be strong and get back to normal. In the last 200m I need to run brave and not worry about the others." Elsewhere, Kenyan Paul Kipsiele Koech stormed to victory in the men's 3,000m steeplechase in another season's best time of 8:01.83 while another Kenyan, Olympic 1500m champion Absel Kiprop, won the "Dream Mile" in 3:50.86.